An 11mi unique green run through outer northwest London following the River Pinn. However, “river” is probably not the best word to use ... it’s more of a gently flowing stream. 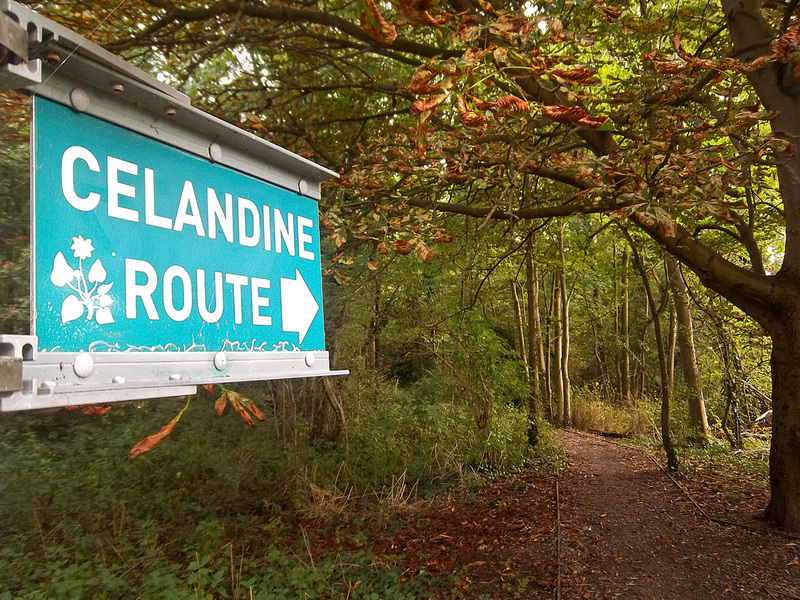 Look for the "CR" or "Celandine Route" signs (or occasionally there are just "Public Footpath" signs). A 9.3-mile almost traffic-free jog through the heart-and-soul of London. This point-to-point run requires a little navigation, for, although it is way-marked, the signposts are often missing at some intersections of trails. In general it’s a safe rule to keep as close to the River Pinn as possible and also to follow a “Public Footpath” sign if there are no other “CR” or “Celandine Route” signs to follow. It would also pay to carry either these text directions or a map with you. In saying this, there are seven helpful maps and info stations along the trail, which even provide rough distances to the next map. It’s possible to cut this run short by running through Ruislip to Ruislip Tube Station (approx. 4mi) or by turning left at Swakeleys Drive (after Swakeleys Park) for Hillingdon Tube Station (approx. 6.5mi). You can also add on at the end with an out-and-back venture in three directions along the beautiful Grand Union Canal. Start: Pinner Station. Run down Station Approach, turn left onto Marsh Road and then right onto West End Avenue, follow to its end. 0.5mi: West End Lane. Turn left into West End Lane and then the first right into Cranbourne Drive, where you will see the finger post marking the start of the Celandine Route: a trail passing behind the allotments. Follow the River Pinn (which should be called a creek) through the wood to Cheney Street (keeping the stream on your left). 1.0mi: Cheney Street. Cross the street and follow the trail parallel to the stream, then cross High Road Eastcote, run through the cricket ground, turn left at Joel Street, and then right at the next two roundabouts. Look for the trail to your right shortly after the second roundabout. 1.6mi: Eastcote Village. Enter the tree-lined trail running on the north side of the stream. Follow this trail, crossing two streets, looking for the trail opposite on both occasions. 2.1mi: King's College Playing Field. The trail crosses the southern edge of these grass fields, which include a cool old cinder running track. Shortly after the cinder track, the trail crosses the stream to reach St Martin’s Approach. 3.2mi: Grasmere Avenue. Turn left here and then right down Woodville Gardens. Run to the end of the road, enter the gate, and cross the paddock. From here run on the south bank of the stream for 2mi all the way to Swakeleys Drive (passing Copthall and Swakeleys Rds). 5.2mi: Swakeleys Drive. Exiting the park, turn right, cross the road (use the crossing) and enter Warren Road. Then follow the footpath signs into the wood. This will take you around the back of the school to a footbridge that crosses the A40. Then cross the narrow strip of wood to the paddock. 5.9mi: Unmarked Fields. With the A40 and wood behind you, turn left to run parallel (east) with the A40. Cross the stream and then follow one of the more southeasterly paths to reach the rail footbridge. Cross it and run on to Hercies Road. 6.6mi: Hercies Road. Turn right and follow Hercies till you turn left on to Honey Hill. Then turn right on to Vine Lane, following it to its end at Hillingdon Hill (opposite St John the Baptist Church). 8mi: St John the Baptist Church. Cross Hillingdon Hill and then follow (the almost opposite road) Royal Lane. Turn right into the footpath that runs next to the running track. Cross Kingston Lane and follow the footpath opposite to reach Church Road. 8.9mi: Church Road. Turn left at Church Road, then left again to stay on Church Road at the roundabout. Shortly after, turn right to re-join the stream via a nice gravel path. With the stream on your right, follow this path all the way to High Street. 10.1mi: High Street. Turn right here and, after 250m, turn left to follow the tree lined path to the canal towpath. Turn left. 10.5mi: Grand Union Canal. Follow the towpath south to reach High Street once again. Run under it and then turn left to join the street and cross the canal to, finally, turn left again onto Station Approach—the end of your run at West Drayton Station 11mi later. Surface: Dirt, gravel, sealed, and grass. Terrain: Net downhill (but barely noticeable) with undulations. Weather Warning: Trails between miles one and six can be boggy. Traffic Warning: Many street crossings—take care. Times: Many unlit portions so best avoided after dark. Toilets: At the two stations and in nearby Ruislip (3mi into the run). Thumbs Up: A largely green run over a variety of surfaces through sleepy west London suburbs. Thumbs Down: Lack of way-markers and the rail connections can be a little tricky to workout.